Halibut is a favorite fish for many people because of it’s mild taste and meaty texture. I think halibut makes the perfect fish and chips, but we have something a bit more gourmet here. Arrange onion slices in the bottom of a baking dish sprayed with non-stick spray and place the fish on top. Combine the next four ingredients and spread over the fish. Combine wine, lemon juice, dill and pepper and pour over the whole thing. 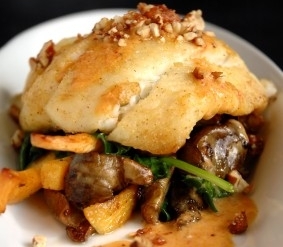 This baked halibut recipe is perfect for a special dinner or to serve company. Of course it is so quick to make, it is a perfect weeknight easy dinner recipe too. The mix of wine, lemon juice and dill give the fish a wonderful flavor. It’s perfect served with rice pilaf. Baked fish recipes like this make perfect diabetic meals. Less rice and more vegetable make this a nice low carb diabetes recipe. If you like this recipe, I’d love you to Pin it to Pinterest, Tweet about it, Like it on Facebook and leave a comment or your own favorite recipe below. If you love our baked halibut with vegetables but want to kick it up a notch, try our Cajun Fish recipe.